Type Trainer / ground attack. Armament 3 Machine guns; 500lb (227kg) of bombs. History First delivery March 1939; final deliveries June 1942. 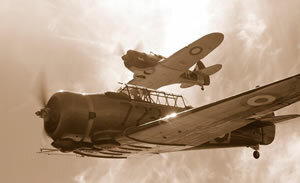 The Commonwealth Wirraway (Aboriginal for challenge) started life as trainer based on the North American NA-33, however the out break of war saw the Wirraway serve in a host of roles. 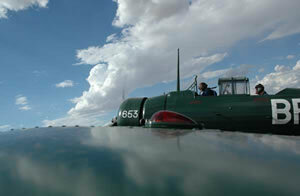 The aircraft was used for ground attack, reconnaissance, dive bomber and also saw action as an interceptor where it was credited with the shooting down of a Japanese Zero over New Guinea. The versatile aircraft saw service throughout the second world war even after the arrival of more advanced allied aircraft. 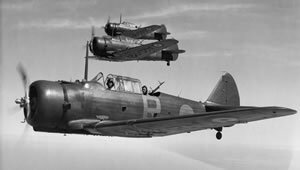 The Australian Air Force placed an initial order for 40 Wirraway's which gave it the designation of A20, its company designation was CA-1, these first flew in March 1939. 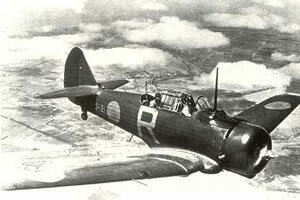 A further 60 aircraft were ordered in the Spring of 1940, with the company designation of CA-3 this only differed from the CA-1 in minor details. The company produced other variants which differed in structural detail and armament these included the CA-5 (32 aircraft), CA-7 (100 aircraft), CA-8 (200 aircraft) and CA-9 (199 aircraft). In June 1942 150 CA-16's were ordered by the RAAF, these aircraft differed significantly from earlier variants, the seconded crew member was removed and the two machine guns eliminated. These aircraft could be armed with up 500 lbs (227kg) of bombs and were used primarily in ground attack and bombing missions.